You’ll learn everything there is you need to feel comfortable in the Digital Age. 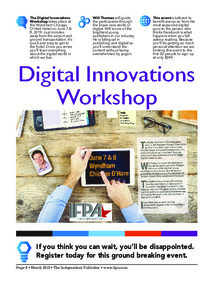 The Digital Innovations Workshop takes place at the Wyndham Chicago O'Hare Hotel on June 7th & 8th, 2019. Just minutes away from the airport and ground transportation. Once you arrive you'll learn everything about the digital world in which we live. Will Thomas will guide the participants through the brave new world of digital. Will is one of the brightest young publishers in our industry. He is bilingual in publishing and digital so you'll understand the content without being overwhelmed by jargon. This event is tailored to benefit everyone from the most seasoned digital guru to the person who thinks Facebook is what happens when you fall asleep reading. Because you'll be getting so much personal attention we are limiting this event to the first 30 people to sign up at only $349. If you think you can wait, you'll be disappointed. Register today for this ground breaking event. We guarantee you’ll go home with new ideas! If you're looking for new ideas to grow your business and solve those problems keeping you up at night then now is the time to reserve your space at the IFPA Fall Leadership Summit. Our focus is to make this meeting all about you...and your needs. This meeting will have lots of idea sharing opportunities and is a great opportunity to get help with your toughest challenges and hear how others ARE finding success in these challenging times. If you're looking for new ideas to grow your business and solve those problems keeping you up at night then now is the time to reserve your space at the IFPA Publishers Summit! This event has sold out the last several years and we expect this year will be no different. Our focus is to make this Publisher Summit all about you...and your needs. We will use your input prior to the Summit to shape the sessions, to answer your questions and to guide the discussions.